Appropriate computer activities were selected and loaded onto the computer. In addition, at each session an assistant turned on the computer and set up all of the equipment. The assistant helped the participant choose an activity and helped them with the activity as needed. 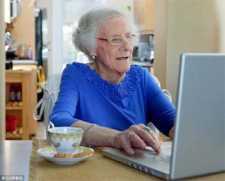 The results of the study showed that "While our sample was small, the findings suggest that computer activities may meet needs for enjoyment and stimulation in elders who have limited activity opportunities and are under-stimulated." The bottom line is that while computer activities can be an effective way to engage someone with dementia, before investing in a computer and a desk, there needs to be a plan in place. You can't just put a computer on a table, plug it in and expect that residents with dementia will be able to make use of the investment. The computer needs to be set up with programs that are appropriate and can be accessed from a menu that is easy to use. Each potential participant needs to be "trained" on the use of the computer, how to choose an activity and how to use the activity. Once all that is in place, the most important aspect is that someone, be it a staff member, family or volunteer has to be available when the person wants to use the computer to set up the activity and be available to offer technical support throughout the activity. Choose and install appropriate apps such as those suggested in the study or in our article "Windows Computer Apps for Dementia"